If you’re about to have a house inspection, one area you don’t want to neglect is your railings. Though it may seem like a simple matter of fencing in an area or slapping on a rod here or there, the truth is that railings are essential safety features in homes and are therefore highly regulated. Here are pointers that will let you know what to look for or ask when it comes to railing requirements. Handrailing – Continuous sloping or horizontal railing secured at both ends, designed to be gripped by hand for support or guidance. Handrails may be found along stairways, steps, ramps, baths, walkways, or wherever else one might need their assistance. Guard Rails – Railing installed along the edges elevated platforms to create barriers that prevent falling. These are placed along the sides of decks, exposed landings, and other leveled platforms where falling poses a safety risk. Guardrails can also be placed along exposed steps and stairways that preclude handrails. According to Virginia Building Code railing requirements, any structure that has steps or stairs with more than three risers requires a railing. Additionally, balconies or platforms more than thirty inches above another surface requires guardrails. These requirements apply to public, private and commercial property, so decks, pools, exterior and interior staircases and steps that meet these specifications must include the specified railings. 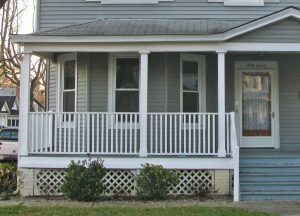 In all cases, the railing used should be somewhere between thirty and forty-two inches above the stair, floor or ground’s surface, and be continuous. If the design being used has gaps in it, those gaps should be close enough that a six-inch sphere could not pass through. If an exit stairway is wider than sixty-six inches, hand or guardrails need to be installed on both sides of the steps. As per the International Residential Code, railings should be easy to grip. Therefore, if the railing is primarily decorative in design, niches or recesses for secure grasping should be included. With the function of grasping in mind, railings attached to walls should leave at least an inch and a half of space for comfortable use. They should also be smooth, without any sharp edges or corners that could pose a hazard to the user. If you choose to have two railings along a staircase, there must be a minimum of twenty-seven inches of walking space left on the stair surface. Depending on part and purpose there are weight resistance requirements for rails. A deck’s guardrail posts/balusters, for example, need to be able to withstand fifty pounds of pressure over a square foot area. The top rail should be able to withstand two hundred pounds, no matter the direction. For this reason, it is critical to make sure you’re using materials that can stand up to the load specifications. To allow those with disabilities safe access, all ramps require railings, cites the Americans With Disabilities Act Design Standards. These railings must be between thirty-four and thirty-eight inches from the ground and extend twelve inches past the ramp’s surface on both ends. All these rail measures are meant to ensure the security of every individual who enters a home. While design details leave enough room for individuality and creative touches, the foremost function of hand and guardrails is safety. Keeping up to code isn’t just important for buying, selling and remodeling your home—it’s important for your protection as well. Need to Check Your Railing Requirements? Contact Först Consulting Group. Selling your home and worried it isn’t up to code? Nervous that your contractor might be cutting corners somewhere? Contact us at Först Consulting Group. We work with homeowners throughout Northern Virginia and the Washington, D.C. metropolitan area to ensure your home is sound.